Sumer (Sumerian: 𒆠𒂗𒂠, ki-en-ĝir; "Name means::Land of the Lords of Brightness"; Akkadian: Shūmerū; Hebrew: שעיר, Shinʻār; "Land of the Rivers") was the earliest known civilization in the world located in southern Iraq, known as Mesopotamia. Following the great flood in 2458BCE, people migrate - building ever larger communities. Mesopotamia accumulates and facilitates cultures and the infancy of new civilizations. 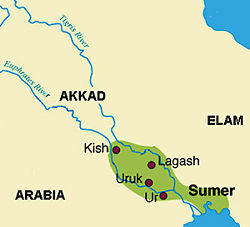 Southern Mesopotamia specifically achieved great particular influence within the cities of Ur and Uruk. Influence continues to expand the presence of Mesopotamia and the Early Dynastic Period is accompanied through this dynamic growth culminating in the Sumerian Civilization consisting of city states organized around a temple and ruled by a priesthood. This page was last modified on 24 July 2016, at 00:56.